Our diver- or ROV-deployed dredges excavate pipelines for abandonment, inspection, and maintenance work by removing clay, rock dump, and other sediments. Use our pile dredges for both abandonment and new field development, in both deep and shallow waters. Our hydraulic pile dredges are best suited for shallow-water use. Our deepwater pile dredge, a 2015 Offshore Technology Conference (OTC) Spotlight on New Technology℠ award winner, is electrically driven with pumps that provide water jetting and suction to excavate piles to 10,000 fsw (3,000 msw). The jetting provides a 360° pattern to fluidize the soil inside the pile, and then suction pumps remove the soil from the pile. To effectively remove subsea sediment and soil, we offer a broad range of dredge sizes and deployment options. Our 6-in (150-mm) dredge can be deployed as a stand-alone system manipulated by a diver at the seafloor, or as part of an integrated ROV package. When used with an ROV, the dredge can be cage or belly mounted. For pipeline excavation, cuttings remediation, salvage, and other offshore tasks, we offer expanded dredge sizes from 10 in (254 mm) to 16 in (406 mm). Our larger dredges can be deployed as stand-alone systems to remove greater volumes of seafloor debris. Our dredges have a proven record of successfully backfilling previously excavated locations. For deeper wells and larger wellhead structures containing increased drill cuttings deposits, our dredging equipment collects and transports cuttings to designated disposal areas. Subsea dredges with attached collection buckets keep drill sites clear of debris. 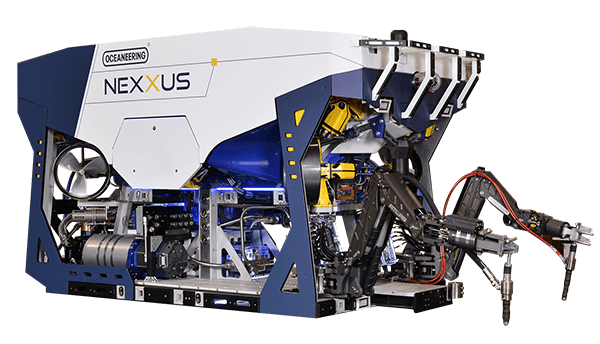 We use an ROV to make subsea connections, and our drill cuttings collection tool can be deployed without a rig.